What do the lovable mutt Sandy from the Broadway musical Annie, the two greyhounds from the recent movie Charlie Wilson's War, and a Chihuahua from Legally Blonde The Musical have in common (besides being dogs, of course!)? All of them were trained by famous animal trainer Bill Berloni. Berloni has been training animal actors for theater, film and television for over 30 years. But he didn't originally intend to be an animal trainer. He started out as an actor, and when he was just 19, he got his big break on stage - except there was a catch. He had to find and train a dog to play Sandy in the production of Annie, all without spending any money. At the time, animals had never been trained for the stage. Berloni successfully found and trained a mutt to play Sandy, rescuing him from euthanasia, and the rest is history. Since then, he has trained all sorts of animal stars. One of those stars will be coming to PawsAbilities - Chico, the Chihuahua actor from Legally Blonde The Musical. Chico and Berloni will present their experiences as a canine actor and an animal trainer on the stage. Berloni will also be signing copies of his recent book, Broadway Tails, about the dogs he rescued and trained for show business. By preordering your copy of Broadway Tails, Susquehanna Service Dogs will give you $2 off the price of one admission ticket to PawsAbilities. 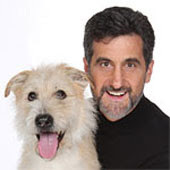 Visit http://www.theatricalanimals.com/ for more information about Bill Berloni and watch Berloni and Chico on the Today Show! 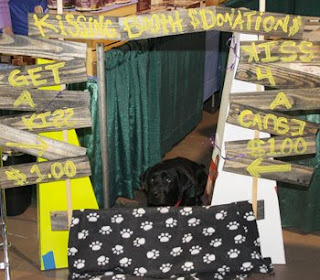 Smooch a Pooch at PawsAbilities! What could be better than kisses from a loving dog? You can get a smooch from one of Susquehanna Service Dogs' therapy dogs at the Smooch-a-Pooch station at the Keystone Therapy Dogs booth. For $1, you can discover exactly how wonderful canine kisses can make you feel. When you're done getting all the puppy love you need, you'll receive an "I smooched a pooch!" sticker. Preorder your PawsAbilities tickets now so you can get your canine kisses. Tickets are also available at the door. Dogs bark and tremble with excited energy at the starting line, waiting for the green light. As soon as it appears, they're off like a shot. They leap over hurdles, snag a tennis ball out of the air and race back to the line so the next dog can run. Handlers jump and cheer on the sidelines. With this kind of excitement, it's easy to get addicted to flyball. This adrenaline-laced canine sport is sweeping the nation, with teams cropping up in nearly every state and even appearing in other countries. But what is this game that's so addicting? Flyball is a relay race for dogs. There are four dogs to a relay team, and each dog must sprint down a lane and leap four hurdles, trigger the flyball box to release a tennis ball, catch the ball and race back to the starting line. Would you believe that some of the fastest flyball teams complete the entire course in just over 17 seconds? The members of Flyball Dogs Anonymous (FDA) freely admit that they're addicted to flyball. It all started in 2001 when they first began training and has just kept growing. They now compete in tournaments up and down the East Coast and have won several first-place ribbons. They're hoping no one ever finds a cure for their flyball addiction because they love it! You can watch the Flyball Dogs demonstrate their stuff at PawsAbilities, but don't blink or you might miss them! What happens when humans try to play flyball? Visit FDA on the PawsAbilities website or the FDA website for more flyball information. They've got rhythm, they've got music... Who could ask for anything more? You may have caught the Steppin' Woofs at last year's PawsAbilities, and if you did, you know that they don't just have rhythm and music. They have a special flair because they aren't just any dance troupe. The Steppin' Woofs are dancing with dogs. The Steppin' Woofs are a canine freestyle dance troupe that performs choreographed dance routines to music chosen by both canine and human performers. (Just like us, dogs have their music preferences.) Canine freestyle is based on basic obedience and agility training, and it showcases the dog and handler's teamwork and creativity. The Steppin' Woofs combine basic obedience steps with tricks and behaviors that come naturally to their canine partners. The human partners often find their dogs are teaching them just as much as they are teaching their dogs. This year, these canine freestylers are bringing a country western flavor to the dance as they perform a hoedown! Watch them do-si-do their way through their newest dance, the square dance. Any dog (and human) can learn to dance freestyle. If you want to try dancing with your dog, the Fieldwood Dog Training Center offers freestyle dancing classes. Email fdtc@pa.net or call Mary Kutulakis at 717-243-4451 for more information on introduction classes. The fire had burned hot and fast. Blackened metal rafters now rest precariously against charred remains of wooden posts. All that remains of the building is a desolate pile of crumbling rubble. K-9 Loki is right at home amid the destruction. Loki is an accelerant dog, one of only 68 federally certified K-9s in the United States and Canada. Her job is to assist investigators in locating and recovering evidence of arson at fire scenes. She can sniff out any type of ignitible liquid, including gaasoline, kerosene and accelerants used in explosives or to start fires. Specially trained and certified by the Bureau of Alcohol, Tobacco, Firearms and Explosives in Front Royal, Virginia, Loki now works for the Dauphin County Criminal Investigation Division with her handler Detective Dennis Woodring. She also assists local, state and federal law enforcement agencies in Pennsylvania and the surrounding states. Detective Woodring and Loki will be presenting at PawsAbilities 2009. Check them out to learn more about Loki and what an accelerant dog does. These dogs are known as the detective dogs. Made famous by such characters as Disney's Pluto, Copper from The Fox and the Hound, Bruno from Cinderella and Duke from The Beverly Hillbillies, it's easy to recognize them from their long, floppy ears, sagging jowls and wrinkles, especially around their neck (the "dewlap"). Their most distinctive feature, however, looks common enough - their nose. 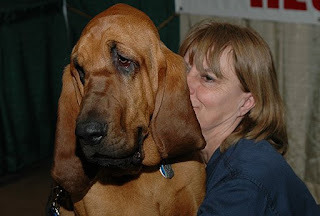 Bloodhounds are famous for their ability to follow any scent. Remember the Bumpuses' dogs from A Christmas Story? Even though that was a comic scene where the bloodhounds followed their noses right to the Parkers' Christmas turkey, bloodhounds have a serious ability to sniff things out. They've been known to pick up trails that are nearly 100 hours old! Summit Search and Rescue (SSAR) takes advantage of these dogs' amazing noses. SSAR is a nonprofit agency of man-trailing bloodhounds. They assist local agencies to locate missing people - lost children, individuals with Alzheimer's who have wandered off, missing hikers, etc. SSAR's bloodhounds also live up the bloodhound's reputation as a detective dog, helping police find suspects who have fled the scene or locating evidence left by suspects. SSAR's three noses - Boone, Apache and Merit - are specially trained to follow a person's scent. After catching the scent from something a person wore or touched, these amazing dogs can track it through almost any terrain. Summit Search and Rescue will be at PawsAbilities to demonstrate bloodhounds' man-trailing abilities. Be sure to check out their demonstration and information table! There's Nothing Like Homemade Goodies! Most people prefer homemade goodies to treats bought in the store. They're often healthier for you and they taste better. If you prefer the taste and healthiness of home cooking, why should your dog be any different? But in today's busy world, you may not have time to cook for yourself, let alone your dog. Grocery stores have a wealth of quick, healthful options for you, but what about for your dog? Luckily for you and your four-legged friend, there are many canine kitchens and bakeries dedicated to providing delicious and healthy, all-natural, sugar-free treats for dogs. Several of these bakers will be available in the PawsAbilities Canine Marketplace, vendor booths with products and services especially for dogs and dog lovers. You'll be able to buy, and perhaps even sample, some of these tasty homemade goodies. 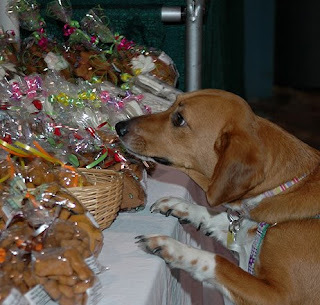 Check out our list of PawsAbilities Vendors to find out who's going to be at Susquehanna Service Dogs' PawsAbilities 2009. They've trained their whole lives for this moment - stealing your socks and sprinting away, kissing your face as if they'd never stop, squeezing themselves under the rungs of your chair just waiting to snarf up the crumbs you drop. Now these canine athletes will have a chance to go for the gold in PawsAbilities' Dog Olympic Games! 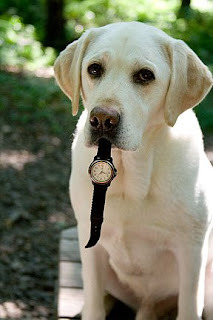 Tail Wagging - Can you get your dog to wag his tail in excitement just from hearing the names of fruits and vegetables? Two teams line up on opposite sides of the ring with handlers facing their dogs and dogs' tails facing inward. The team with the best tail-waggers advances to the wag-off to determine the tail-wagging champion! Kiss-Off - This competition will determine the champion canine kisser! All your dog needs to do is kiss your face without stopping. Doggie Limbo - It's the limbo with a canine twist. Dogs are split into two groups - one for large dogs (over 18 inches) and one for small dogs. Each group shimmies under a bar to find out exactly how low they can go! Over/Under/Through - This obstacle course will test your dog's agility and speed. Try to make it through all the obstacles with the fastest time. Going for Pairs Relay - Teams send dogs one at a time to a pile of socks in the middle of the ring. Each dog retrieves one sock and races back. The team with the most PAIRS of socks at the end wins. For a complete list of the games, check out the Dog Olympics on the PawsAbilities website. Registration for the Dog Olympic takes place on the day of the event, so bring your four-legged Olympian to PawsAbilities and let the games begin! These dogs can pick up quarters without swallowing them. They can open and close doors and turn light switches on and off. They can empty the dryer. They can pull a wheelchair, retrieve drinks from the refrigerator, find a cordless phone and become invisible in restaurants. No, they don't have superpowers, but they do have special skills. They are Susquehanna Service Dogs, specially trained to serve the individuals they're paired with. These service dogs assist individuals to lead richer, more independent lives. A woman who needs a cane to walk may have to focus all her attention on watching her steps, but with the support of an SSD balance dog, she can lift her head and greet the people she meets. Another service dog may assist his partner by accepting packages at the grocery store, allowing his partner to become more independent. Each dog receives special training to assist their partner with their unique needs, and each dog does what dogs do best - provide love and companionship and help individuals lead rich, full lives in the community. 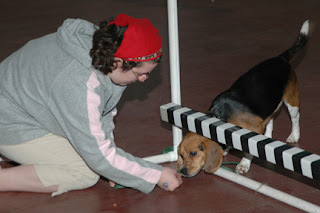 Be sure to check out the Susquehanna Service Dogs at PawsAbilities 2009 as they demonstrate their skills. Children can also meet the service dogs in the PawsAbilities Kids' Area, where they'll learn how to approach dogs and how to "dress" a service dog and take him for a walk. For more information about the Susquehanna Service Dogs, visit our website. Say goodbye to spring fever and hello to PawsAbilities 2009! In less than three weeks, Susquehanna Service Dogs will be holding our annual celebration of dogs and their amazing ability to brighten people's lives. Can you believe we're in our 13th year? Join us for PawsAbilities on Saturday, March 14 and Sunday, March 15 from 8 a.m. to 4 p.m. at the Farm Show Complex and Expo Center in Harrisburg, PA for exciting activities, demonstrations, awareness groups and vendors for you, your family and your dogs to enjoy. There's something for everyone, whether you walk on two legs or four. In the weeks leading up to the big weekend, we'll post information about the games and events you'll be able to watch and participate in, as well as fun canine facts and trivia. Visit our PawsAbilities website to learn more about the canine fun we have planned. Mark your calendars for PawsAbilities 2009!